Attention all type lovers. This call for art is for you! 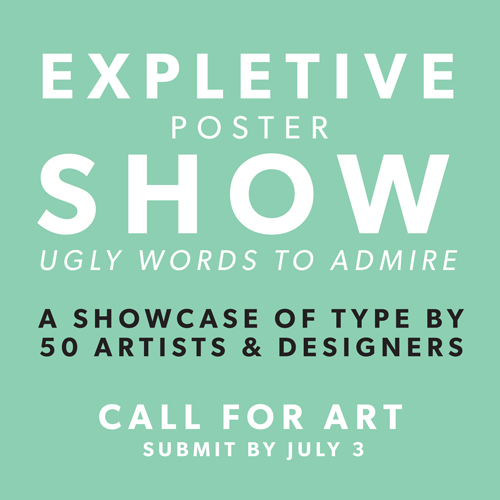 We're looking for 50 artists and designers to collaborate on our September Exhibition : "Expletive Poster Show : Ugly Words to Admire". Yes, the name says it all -- we're celebrating some of those nasty words, some of those expressive phrases, and (for those of you ultra-creative people) those nonsensical exclamations born from frustration or excitement. Each contributing artist is asked to design a 13 x 19 poster containing the words / phrases / #@$*! of their choosing in any way they want, with executive power to make it as blatant or clever as they wish. Chosen artists will be asked to submit final artwork by August 20th. More dates, schedules & information will be sent to our final list of artists after the call for art ends. The final pieces will be displayed for sale / show in our brick & mortar gallery as well as a virtual gallery of the collection. We'll also be listing the works on our online shop for everyone to get the chance to purchase their favorite pieces. If you are interested in participating in the show or know someone who might be perfect for this collaborative exhibition, please submit a link to your portfolio below. We'll be choosing our fabulous 50 after our JULY 3 DEADLINE. Please share a link to our call for art with anyone else you think might be a great fit! So, get ready and let's see what you've got. EDIT : The call for art is now closed! Thanks to everyone that submitted! We'll be posting our group of artists shortly in a follow-up post and will be contacting the participating artists soon! Thanks again for your enthusiasm and for sharing your work with us!